After a number of months studying and final 2 weeks full 100% dedicated preparation I passed the CCIE Data Center Lab exam last week on April 25th in Brussels at first attempt!!! This is my fourth CCIE title and I can honestly say that this is the title means a lot to me! Currently there are so few individuals who passed the CCIE Data Center lab and many have failed it already. What did I use for preparation? Of course I used the CCIE Data Center Workbook from IPexpert for my preparation, because I wrote the book. After writing the labs for the past couple months I really had to re-do them all to get a feeling about the entire picture again. This has been an invaluable resource with labs that are a lot harder than the actual lab tasks! In my work for a Cisco Gold Partner (Telindus) I did a lot of projects with Nexus 7000, Nexus 5000, Nexus 2000, MDS switches and a ton of UCS systems. This is where I found that I learned most of the knowledge that was required for the test. The single most important preparation of all my Expert level certifications was absolute focus in the last 2 weeks before the test. I practiced many hours on the IPexpert CCIE Data Center rack, but not too much 😉 During the final week I got down to practice everything over and over again until I got bored doing most of the different technologies that were on the blueprint. Absolute focus is required to pass any Expert level certification! The past week a lot of people have been asking me how to approach this lab strategy wise. I think the CCIE Data Center is definitely a different test than the R&S or SP (the more protocol based tests). This test is very much about the Data Center specific features that Cisco introduced in their Nexus, MDS and UCS products. Which is also easily distractible from the blueprint. You should come from a solid Routing & Switching background so you do not need to worry about the basic switching and routing protocols that are running on your switches and you should focus a lot about the DC specific features. My strategy during a CCIE test is to finish the exam as quickly as possible. This strategy doesn’t suit everybody as you need to type really fast and interpret the questions very fast. What I think is good about this strategy is t hat it also doesn’t allow you to think very deep about certain tasks, which is usually a good thing in a CCIE test (sounds weird, I know). My guess is that most people fail this test, because they are used to implement certain features on a best-practice way, or are getting used to do things in a certain way that they don’t change that in the test and automatically do things that they shouldn’t. You should really only do what the question tells you to!!! Nothing more and nothing less. Another big issue in this particular CCIE test is that a lot of things are dependent on each other. Which means that you can easily lose a LOT of points on really basic mistakes, because the end result is that other things down the line don’t work. Which again frustrates people because they get low scores on their score report and they don’t know what caused it. For example you can loose a lot (or all) points in the UCS section if there is something wrong with your network and/or storage configuration. Because the UCS server will not work as required. You can even get the server to boot on FC and still loose points, because you misconfigured your network uplinks, which means the server doesn’t work. I finished around lunch time with all the tasks, this means by configuring everything without verifying a lot. During lunch I tried to relax a bit, because there were some things not working yet. After lunch I started fixing the few things that weren’t working yet, where I was able to fix most of them, except 1, which I ended up leaving at the end of the day. My verification was extensively. I really went through all tasks over and over again until I was absolutely certain I got the task 100% right and most important 100% understood. I started to doubt some of my solutions at the end of the day, where I ended up changing some things, where I don’t know if that was the right thing to do 🙂 Eventually those changes were only supporting some task and never interfered with the immediate solution, so I figured I could just put it on as over-configuration is allowed! The wait was so painful. I had a very bad sleep that night, waking up every 30 minutes and checking my iPad for the good or bad news. Finally at 5.30am I got the news, it was a PASS!!! A question that has been asked a number of times now is “What’s next?”. 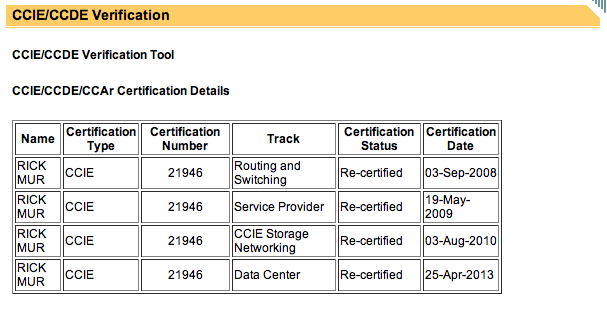 Well currently I have no plans on pursuing any more CCIE titles. A quote I read on Twitter last week really inspired me “Spend more time creating”. I want to spend more time creating things. One of the is of course finishing the CCIE Data Center Workbook for IPexpert. Next are other tasks. I will be coaching a group of Telindus engineers to gain more Data Center knowledge and there are a lot of other plans. Be sure to check out the interview I did with IT Certification Master (http://www.itcertificationmaster.com/rick-mur/). For the rest of 2013 my plans are working on some amazing projects, finish the CCIE Data Center workbook, move into my new house and make a start with some other ideas I have. Thanks for sharing you story. I am getting inspired. I am currently studying for the R&S track with ipexpert and also found this to really inspiring. My first exam is next week so I’ll definitely try using the few day left just to focus. Rick, you are an inspiration to me who is still trying to pass CCIE #1 I failed back in April and am going again in September as I realised I was short in many areas – I will be reading through your posts a lot more for some study tips – are you going to stop now or do you have to do another? Hi Rick. Do you have any idea when the Lab Workbook will be finished. I sit my lab in early October. i am raju ,,,planning to do ccie -dc ..please help me out how to prepare for exams ..
Want to get in touch? Please use the contact form, LinkedIn or Twitter.